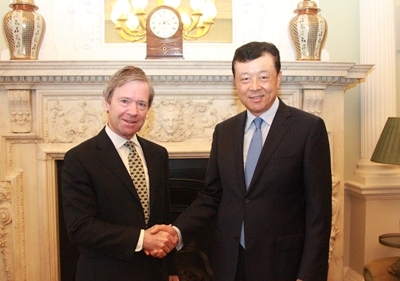 On 22 July, Ambassador Liu Xiaoming met with Lord Mayor Mountevans of the City of London. They exchanged views on issues relating to China-UK financial cooperation and other topics. Ambassador Liu said that China stayed committed to the"golden era"of China-UK relations and would be willing to further the practical cooperation in various sectors. Chinese companies such as Huawei and Hainan Airline continued facilitating the investment in and cooperation with the UK after the latter's vote to leave the EU, showing the confidence of Chinese companies in the UK market. Calling the City of London an important pillar in the financial cooperation between China and the UK, the Ambassador said that China would be willing to continue deepening the cooperation with the City of London in financial services and other sectors. He expressed the hope that the City of London would provide more opportunities and better services to Chinese companies. Lord Mountevans emphasized the role of the City of London as an irreplaceable international finance centre despite the uncertainties in UK's relation with the EU after the Brexit referendum, citing unique human resources and legal advantages. The City of London attaches great importance to the cooperation with China and is willing to deepen and strengthen their collaboration in various fields including financial services, said the Lord Mayor. He was looking forward to leading a delegation to China in September to promote China-UK cooperation in financial services, green finance, insurance and sea transportation.